Aston Martin Racing has signalled a high-profile return to the Japanese Super GT Championship, with the Vantage GT3 racing in the Super GT 300 class. 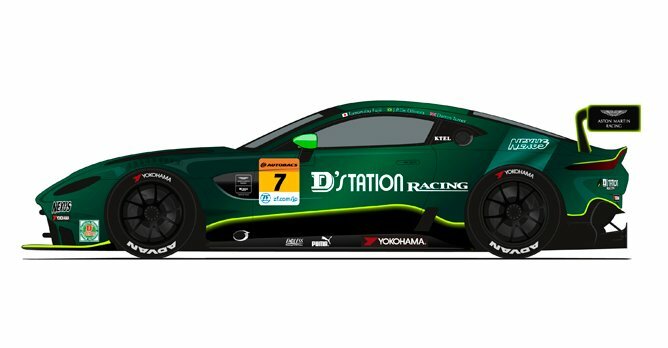 Aston Martin has agreed an important new long-term partnership with the D'station Racing AMR team, signalling a high-profile return to the Japanese Super GT Championship for the British luxury sportscar manufacturer in 2019. The Aston Martin Vantage GT3 will compete in the GT 300 class of the Japanese Super GT Championship under D'Station Racing AMR team The agreement, which features the highest level of partner support from Aston Martin Racing, includes a one-car programme in the Super GT 300 class using the new Aston Martin Vantage GT3. The #7 Aston Martin Vantage GT3 will be driven by series multiple race-winners Tomonobu Fujii and Joao Paulo Oliveira, who between them have more than 25 years of experience in Japanese GT racing. They will be supported by works driver and three-time Le Mans 24 Hours class-winner Darren Turner in the 804km round at Fuji Speedway on 4 August. D'station, run by the successful KTR motorsport preparation company based near Fuji Speedway, is entering its third year of competition in Japanese Super GT and by aligning with Aston Martin intends to secure its first victory in the category and compete for the GT 300 class title. The Vantage GT3, the first Aston Martin to compete in Japan's top GT series since 2012, will run in a predominantly dark green livery featuring the British manufacturers' AMR Performance sub-brand and the team's tyre partner Yokohama. Copyright © 2019 Auto Hybrid | All rights reserved.